The OS66 series has been discontinued. Please see the OS550A-BB series as a possible alternative or contact our Temperature Engineering department. The OS66 Series of non-contact infrared thermometers extends OMEGA’s OS65 Series shown on preceding pages. The difference: OS66 Series is designed for higher temperature applications, with accurate results in the 800 to 1500°C (1500 to 3000°F) range. 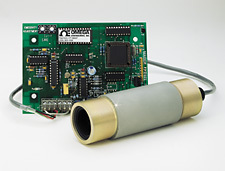 The OS66 Series includes an infrared sensing head, signal processor module and detachable 4.6 m (15') interconnecting cable. The OS66 Series works with the same accessories as the OS65 Series. *Insert optics code from optical table. Note: If electronics board is to be mounted in OS65-CC4 card cage, add suffix “-CC” to model number. No additional charge. -1 50:1 1/4" at 15"
-2 75:1 1/4" at 18"
†Note: Only one digital communications option (either RS-232C or RS-485) can be specified. Use of viewing window requires additional sensor calibration. Consult OMEGA for details.